Report to Los Angeles International Airport (LAX) by 8:00 p.m. and proceed to ticketing counter. Depart Los Angeles, CA on our flight to Taipei. Lose one day crossing the International Dateline. After a short layover in Taipei where we endure the Big Speech, we depart for Vietnam. We land at Noi Bai Airfield (built in 1978 to replace the heavily bombed Gia Lam Airfield) and proceed through immigration, retrieve our bags, clear customs, and board our waiting motorcoach. We then cross the Red River and its dikes to explore the Ha Noi environs. Ha Noi is an ancient city that was founded in 1010, nearly 500-years before America was discovered. We visit Hoa Lo Prison (Hanoi Hilton) and stop at the John McCain Monument, located by the lake where he parachuted into and was captured. Tonight, we enjoy our Welcome Dinner. This morning we visit the War Museum, Ho Chi Minh Mausoleum, the Ho Chi Minh House, and the One Pillar Pagoda. We then dine at the fabulous Lotus Buffet. Later this day, we head back to Noi Bai to catch our flight to Phu Cat Airfield. Upon landing, we head to our hotel in Qui Nhon and check in for the evening. After breakfast, we make brief stops at the former site of Qui Nhon City Airport and where the 1st Cav came ashore on September 11, 1965. We then head south along Highway 1 and pass Tuy Hoa North Airbase and the Tuy Hoa South Airbase. Along the way to Nha Trang, we view several Cham ruins (the Cham people ruled what is today's Vietnam from the 5th to the 12th century) and other interesting sites. Today is a free day to shop, explore, and relax. Lunch and dinner are on our own. After breakfast, we head south along Highway 1, passing through Phan Rang and stop in Cam Ranh to visit the site of the former 22nd Replacement Battalion, the former site of the 6th Convalescent Hospital, and the 14th Aerial Port. We make a brief stop heading south along the coastal highway to see the Sand Dunes of Mui Ne. Before arriving in Phan Thiet, we stop at La Gi for a Kodak moment. 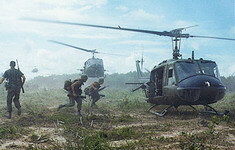 Departing early, we head over to Phan Thiet Air Base (home of 2nd/7th of the 1st Cav and later, the HQ of the 3rd/506th Infantry, 101st Airborne) aka LZ Betty. We turn southwest along the coast, passing through Long Hai (ARVN Special Forces Training Camp) arriving finally at Vung Tau. After lunch, we are free for the rest of the day and dinner is on our own. Be sure to enjoy the night life in this former in-country R&R Center. This morning we visit a few local sites such as Lighthouse Mountain, Black Beach, and Vung Tau Port. After a western lunch at David's Pizzeria, we abandon our motorcoach for the high seas. We board a hydrofoil for a run up the winding waterway that is the Song Saigon. At our landing in Ho Chi Minh City (still called Saigon by most Vietnamese), we are picked up and delivered to our hotel. We rise very early this morning and head north to Song Be (Phuoc Binh) to investigate FSB Buttons and other local sites. After lunch, we turn west to Bu Dop, Bu Gia Ma, Nui Ba Ra, and Loch Ninh. We then head south to Tay Ninh where we view of the eerie 3000' monolith known as Nui Ba Den Mountain (Black Virgin Mountain). Tonight, we overnight in Tay Ninh City. After a leisurely breakfast, we explore the town of Tay Ninh, including the entrance of Tay Ninh Combat Base (now an active duty Vietnamese Army Base). We also attend at the Noon Ceremony at the Cao Dai Holy See (Temple). Before leaving Tay Ninh, we have lunch at Ms. Tuyiet's restaurant. Tuyiet is a highly-decorated former VC Soldier in the Tay Ninh - Cu Chi AO. Next, we visit the Cu Chi Tunnel Complex and later we pass through the Iron Triangle and Hobo Woods on our return to Saigon. Early this morning we stop at the Phu Tho Racetrack. Next, we enter Cholon (considered the largest Chinatown in the world by area). While here we visit Cha Tam Church (Saint Francis Xavier Church) where SVN President Diem had fled and disguised himself as a priest during the 1963 coup. It was from this place that Diem and his brother were captured, taken away, and assassinated. From here we head south on Highway 1 to visit the town of My Tho in the Mekong Delta. We take a boat trip on the Mekong River to visit Thoi Son Island (Coconut Island), and its local houses, and workshops. We return to Saigon for the evening. Today we visit sites in Saigon to include Reunification Hall (the old Presidential Palace), Notre Dame Cathedral, and the Old French Post Office (a great place to purchase last-minute gifts and trinkets). We also drive by the site of the U.S. Embassy compound (now the U.S. Consulate) to see the place where Viet Cong sappers blew a hole in the compound wall and gained access to the Embassy grounds during the 1968 Tet Offensive. Lunch is on our own and the afternoon is free. You can take a walk to Ben Thanh Market or stroll along old Tu Do Street (now Dong Khoi Street) to explore a myriad of little shops where you can discover special gifts to bring home. Or simply sit and watch the world go by from one of the city's many caf�s. However, all hands are required this evening at our very special Farewell Dinner. After breakfast, those heading home transfer to Tan Son Nhut Airport for the flight to Taipei. Departing from Taipei, we gain a day enroute to the continental United States by re-crossing the International Dateline, arriving in Los Angeles (LAX) at approximately 4:30 p.m. this same day. VBT - Has virtually all-inclusive pricing. (Beware of hidden charges forced on you by other tour operators).